Hello Laila, I'm a JSS 2 Basic Science teacher. I gave my students an assignment, as we were discussing chemicals. So I asked them to find out what a Nuclear bomb is and here is one of the funny answers I got. 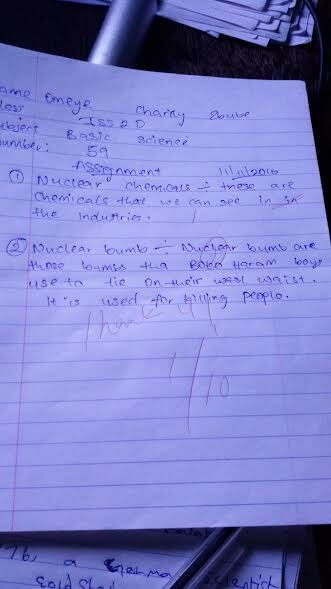 According to this student, Nuclear bombs are those bombs that Boko Haram boys use to tie on their waist. It is used for killing people. And our teacher replied: Thank you! lmao.